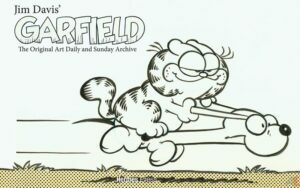 A new publisher enters the Artist’s Edition format book market as Hermes Press brings us Jim Davis’ Garfield. The material is presented chronologically, with a sampling from the three decades the strip was produced on paper. It opens with an introduction by Davis himself, and closes out with an afterword by the book’s editor and designer Eileen Sabrina Herman. Scans are clean and clear, with no softness or blurriness. The only soft image is the cover, which is a greatly enlarged panel. 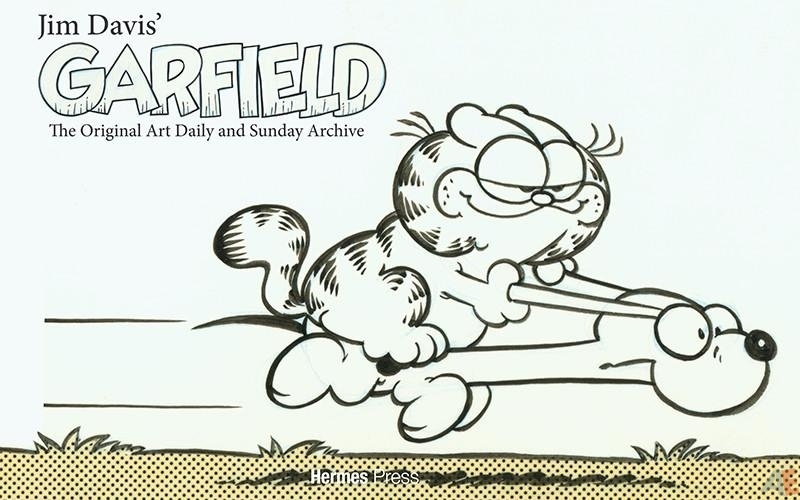 The early strips where David did it all don’t have notes, but the later strips show production notes. Throughout we’re treated to occasional notes concerning the creation or context of the strips. For the most part the art is clean of corrections, with a rare dialogue replacement. Davis sure loved Zip-a-tone! All the dailies are printed at full size, with the Sundays reduced, as mentioned in the publisher’s blurb. I checked Heritage and the average daily is 5″ x 15″ and the average Sunday is 12.5″ x 18.5″. Most pages have two dailies, or a daily along with its rough. Sundays are printed on one page, with part of the Sunday enlarged on the opposite page. Sometimes it’s one large panel enlarged, but for the most part it’s about two thirds of the Sunday enlarged. Readers are presented with a lot of empty space on the page or enlargement of portions of strips. Why not enlarge the book slightly and print the Sundays at full size and put two dailies to a page? This book was solicited as 144 pages; Amazon is still listing that as the page count. The Hermes Press site lists this book at 128 pages. It’s actually 112 pages, with no reduction in the solicited price of $95. Somewhere along the way the page count was reduced by 32 pages for the same cost. Add in that every Sunday is partially enlarged on a second page and the end result is a book with a lot less strips than could have been included. Design is clean, with an eye catching choice of page divider used to full effect through colour variation. Panel enlargements present well. Page numbers run along the outer edge of the page bottoms, but we have to look at the strip to identify dates. Production is solid. Being wider than taller for a book this size adds additional strain, but we have sewn binding that appears quite sturdy. The paper is matte and a lighter weight than we’re used to for original art books. There is no bleed from other pages; the art consistently looks good. It’s hard not to compare this book to the other eighty-one Artist’s Edition format books that have been released from ten other publishers. No shipping box, no shrinkwrap, thinner paper. Compelling design, wide range of material and excellent scans. It’s a great first step, with room for improvement. There is a signed edition available for $125 with a colour cover. For those wondering, Diamond put the wrong cover to the two versions of the book. It’s correct on the Hermes Press site. Here’s Daniel Herman introducing the book. Unfortunately he states all the artwork is printed at original size, which is true of the dailies but not the Sundays.